Drought means changing not only our outdoor water use, but also the way we tend our gardens, parks and schools. If you are a facilities manager, homeowner or invested tenant accustomed to fertilizing lawn and roses every spring, don’t do it this year. The chemicals, salts and nitrogen will concentrate in your garden, in the street-side gutters, in the storm drains, in our already impaired rivers, wetlands and beaches. The reason? They will have no dilution in the form of heavy winter storms sweeping the basin clean. At the rate we’re going, they won’t even have sprinkles. Joining fertilizer and pesticides in the Do Not Touch category should be leaf blowers, which will drive dry soil, mold and contaminants into the atmosphere and, count on it, into our lungs. Most gravely at risk will be gardeners, closely followed by children, the elderly, pets and wildlife. After taking any existing fertilizers, herbicides, “weed and feed” products and insecticides sitting in the shed or garage for disposal at one of LA’s seven SAFE centers, work carefully with whatever stable waste or bagged manure manure that you already have or have ordered. This is not the year to overseed then top-dress and water your lawn. Rather, keep all manure away from the curbside where nitrogen-loaded sprinkler water may then run off into the street. Instead use the manure in alternate layers to start a compost pile to help break down your kitchen vegetable cuttings, coffee grinds, tea bags and eggshells, along with garden clippings, into rich new soil. If you can afford the time and money, and are so inclined, rip out your lawn. If you can’t or don’t want to kill your lawn, click here for how to use less water more effectively. If you don’t do your own gardening — few Angelenos do — but leave it to a weekly or twice-monthly team, talk to the gardeners. Ask them to leave any fallen grass in place rather than bagging it and putting it in your green bin. If they want more money and in fact deserve it, either pay them more or reduce the scope of work in an equitable way. Water and air pollution is not a bargain to be had, or a them-versus-us issue. Insist that the gardeners under no circumstances use a leaf blower on any exposed soil or mulch, something that will at once dry out expensively irrigated soil and aerosolize dust. Because you might be at work and don’t see it doesn’t make it any less damaging for the baby sleeping next door. With this gravest drought on record comes what bodes to be a lethal asthma season. That you see county and city garden teams blowing raw soil in parks, and even around playgrounds, doesn’t make it right. Rather, it speaks to the staggering inertia, cynicism, class war divisions and desperately degraded state of garden arts in Southern California. Above all, we should mulch. Mulch around trees and shrubs, taking care to leave the root crown (where the stem meets the soil) clear of chips or leaves. Use wood chips, use fallen leaves, even use wine corks if you are an eco-boozer. Ideally tree trimmers will have stopped working in February through late July because the sap is rising and birds are nesting. But if you can’t stop what pass for arborists in Southern California from hacking at our tortured canopy, after checking that they have not thrown any diseased trees into the grinder, at least have them drop off the ground wood chips and mulch, then use it to top dress exposed soil to a depth of three to five inches. Wear a mask while moving the material and make sure that your gardeners are also protected. A macho pose over a shovel is one thing, hacking your guts up at night is quite another. Were our elected officials aware of the relationship between the way we garden and the sheer scale of pollution it generates, sale of most garden chemicals and use of leaf blowers might be banned at all times, particularly during drought. Granted, that’s a big might. It’s not just the gun lobby with an unholy grip on our politicians. So it’s up to citizens to do the right thing. Don’t ask me if I think we will change in sufficient numbers to save us from ignorance, depravity and torpor. Hope isn’t rational. But small acts are. So consider this: If you have the opportunity to make these simple fixes for the public good, why wait? To experience a free and crazy educational garden tour designed to foment sustainable landscaping in Southern California, think about going to the Mar Vista Green Garden Showcase. It would be so helpful to have a Spanish language version of this to pass on to gardeners. Any possibility? Well said, Emily. 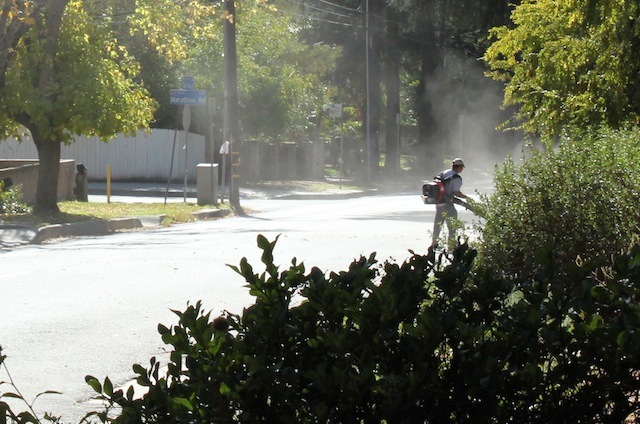 When I jog in the streets of South Pas and San Marino I frequently change course to avoid the plumes of dust created by mow-and-blow crews. And to think that these people have to breathe this stuff all day to make a living! Yes, some wear masks but only the least expensive and probably least effective ones. One suggestion. When I water my old avocado trees, I rake the leaf mulch away, water, water, water, and then replace it. This way I only need to water about once a month or even once every 6 weeks. Barbara, thank you for the comment, which I’ve also added to the bottom of the article. Mary, I will work on a streamlined version, get it translated and post it. Great suggestion. Thank you. Emily, I always appreciate your well thought out commentary on the LA gardening scene. Sigh….sing it to the world! Mulch and no blowers!!!! Hi Barbara, thanks for this post. I’m a block captain in Hancock Park where we are preparing a mass email to the neighborhood regarding gas leaf blowers. Besides informing that blowers are illegal, we want to land the point that high emissions are created by these hand-held devices. The thinking is that hybrid car owners are unaware of the pollution created by the blowers’ two-stroke engine. Can we copy/link part of your text in the email?